Compact Solution Package – Katrin Field Inc.
Take full advantage of the ultra-small size of the miBot™ —our famously easy-to-use and versatile piezoactuated micro robots— with platforms specifically designed to minimize their footprint on cluttered experimental setups and confined environmental chambers. 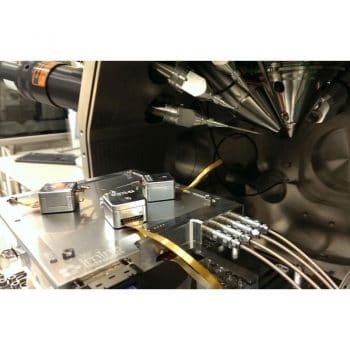 The whole system features up to four manipulators allowing you to independently position the probes and sensors over millimeters with a resolution down to a few tenth of nanometers. Available in various shapes and dimensions, the compact stages accommodate 1 or up to 4 miBots. Like the manipulator, their dimensions are kept to the minimum by not having any electronic function and only serving the purpose of providing an motion arena to the mobile robot. They are designed to be easily mounted on standard optical breadboards and microscope stages with screws and clamps. It is thus very quick to reconfigure your setup to adapt a new experiment. The Compact packages are ideally suited for use at low optical working distance. They are also well adapted to contact large substrates mounted on sample holders that are moved by a positioning stage (e.g. wafer chucks, Petri dishes). Versatile. Install motorized manipulators on upright and inverted light microscopes, probe stations, AFM, optical breadboards, etc. Fast, precise and stable. Move over centimeters with nanometer resolution and maintain a steady position at destination. Keep calm and be more effective.Intuitively interact with sensitive samples without risk of damaging them and get faster results. Affordable and upgradable. Use the same robots for different applications by changing the connected tool.